Comcast’s NBCUniversal will tap the technology underlying Sky’s Now TV platform to bring together content that “consumers are currently viewing on other online platforms for free” and put it “altogether in one place” as it rolls out its free OTT TV service in the first half of next year, according to Steve Burke, CEO of NBCUniversal. Speaking on Comcast’s full-year earnings call – the first quarterly call since its acquisition of Sky – Burke said that the group would however continue to distribute its content to other platforms rather than retain it for exclusive use on its own OTT TV service. Answering an analyst question about the company’s direct-to-consumer strategy, Burke said that the group is currently “just not monetising online as well as we should” and that the best approach to scale up an online offering was to target the “80% of people in the US who are multichannel customers for free” and also Sky customers in Europe, while providing an SVOD service for non-customers who might be interested. He said that this would enable the company to scale up quickly and “accelerate our ability to get to breakeven”. He said that the current plan was to launch in the first half of next year. Burke said that Comcast would “leverage Sky’s technology” for the service, referring to Sky’s low-cost skinny bundle offering Now TV. Burke said that the core target for the service would be existing Comcast Cable and Sky customers, adding that the content on the service would vary from market to market depending on the rights available. He said that the OTT TV service would be “a brand new buyer” for NBCUniversal content but that the company would continue to “work with the best people”. “As more content becomes available, I think a lot is going to be on our platform but we will continue to sell on other platforms depending on the show, and depending on the prices that we can command for those products,” he said. Meanwhile, Sky grew its customer base by 164,000 in the fourth quarter to reach 23.6 million across Europe. Also speaking on the Comcast analyst call, Sky CEO Jeremy Darroch said that he believed Sky’s business “is going to be able to grow faster as part of the broader Comcast organisation”, adding that 78 million homes in the group’s current markets did not yet take pay TV. As an example of where Comcast’s ownership was already bearing fruit, he cited Sky’s plans to take its parent company’s Xfinity xFi WiFi user experience to Italy as it rolled out broadband internet service in the Italian market. 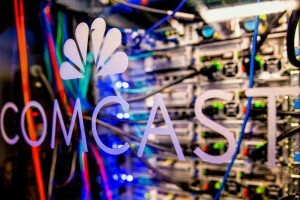 He said Sky would also incorporate Comcast’s voice platform into the Sky Q advanced TV service. Overall, Comcast posted revenues of US$27.8 billion for Q4, up 26.1%. Adjusted EBITDA was US$8.2 billion, up 21.6%.